The holiday season is upon us. It's time for friends and family and merriment - and also cookies and candy and booze and rich food. I approach this time of year with equal parts enthusiasm and trepidation. It's easy to indulge, and even over indulge, so I aim to create dishes that provide balance at a time when meals are dominated by butter and cream and carbs. A salad is the easiest way to get lots of nutrients on a plate, but I also wanted it to be refreshing and acidic on the palate, not to mention vibrant and delicious. Let's be honest, if you are going to serve salad at a holiday meal, it better look as good as it tastes if you expect people to save some precious real estate on their plate for it. 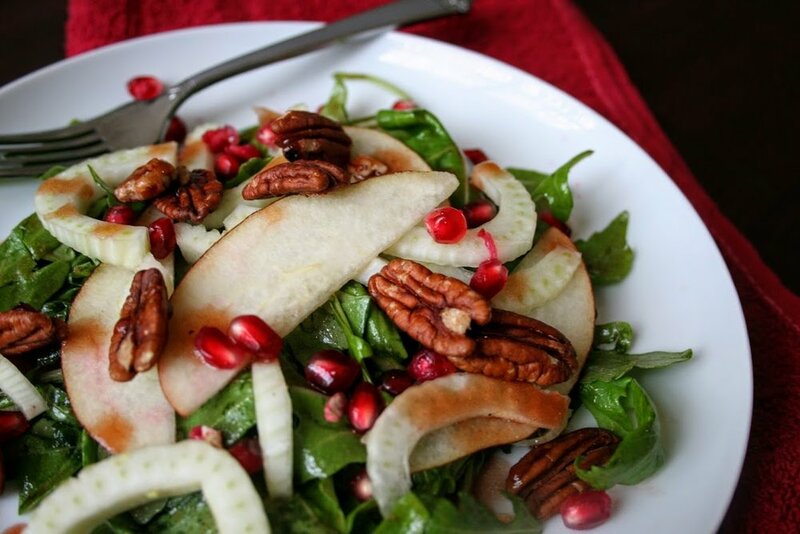 For this seasonal salad, I threw in red pears, pomegranate seeds, shaved fennel, pecans and arugula. It's a pretty festive combo, but I think my favorite part is the dressing, a combination of reserved pomegranate juice, maple syrup, balsamic vinegar, olive oil and salt & pepper. It's got a nice sweetness and depth to it, and a little bit of it goes a long way. A few things about salad dressings: Store bought is the worst (it literally tastes like fake sugar and chemicals...because that's what it is), and there is nothing I hate more than on overdressed salad - you are supposed to taste the ingredients! Dressing is a compliment, not the star. A good rule of thumb is if you put on the dressing and toss the salad and there is leftovers pooling at the bottom, you put too much. Anyways, I digress. 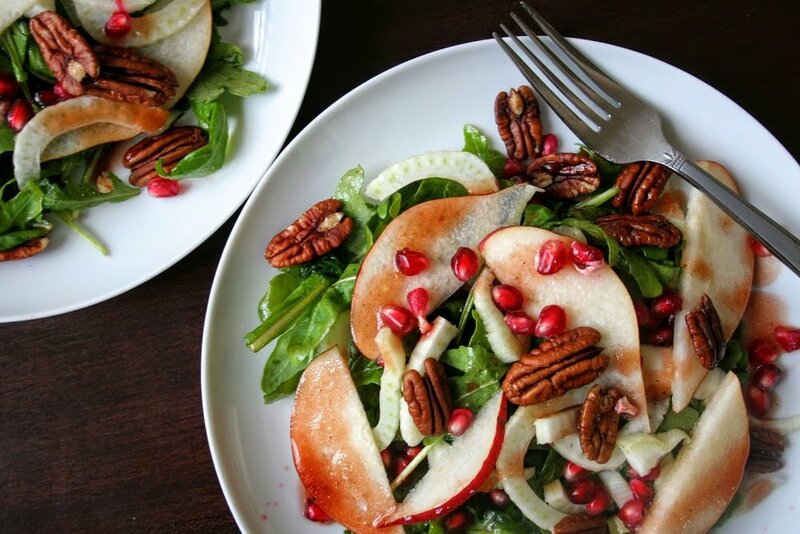 Bring this salad as a side dish to any holiday gathering for easy assembly or pack it for lunch when your go-to salad is feeling less than inspired. Plus now you know how to make your own dressing, so that's one less sad salad in the world! Toss all the salad ingredients into a bowl, or plate individual, layering the ingredients (as pictured). For the dressing, combine the first three ingredients, and then slowly whisk in the olive olive until combined. Season with salt and pepper.